Washburn Law has received one of the largest gift commitments in its history: $1 million from a donor who wishes to remain anonymous. 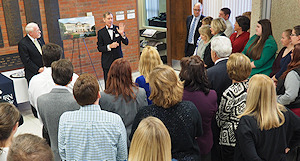 This gift commitment is one of the most generous in the history of Washburn Law and it will become a major philanthropic pillar for the Ideal Place - Building Campaign for Washburn University School of Law. 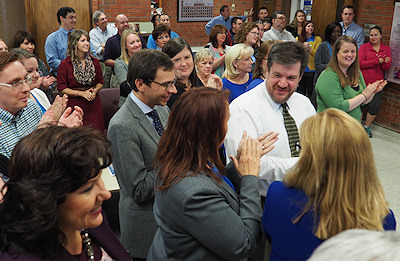 This generous gift and the Ideal Place campaign will allow Washburn Law to further enhance our practical skills development, recruitment efforts, innovative teaching, and the prestige and reputation of the Law School. This gift is a profound investment in the people who will teach and study in this building in the years to come. "We are so very fortunate to have such strong supporters who share our vision for Washburn Law's future," said Patrick Mikesic, executive director of development and alumni relations for the Law School. "We are honored to accept this gift from a donor who wishes to remain anonymous, knowing that it is a reflection of our alumni's connection to their alma mater and a commitment to its future." With this gift, the Ideal Place campaign has topped the $5 million mark, toward a total fund-raising goal of $20 million. To date the campaign has garnered support from faculty, staff, friends, and alumni across the country, including recent graduates as well as those who are well established in their careers. This gift adds to the momentum of this campaign and we look forward to sharing more good news in the weeks and months ahead. The Washburn Law community of talented and hardworking students and creative, committed faculty and staff appreciates the support of alumni and friends who are devoted to supporting Washburn Law's continued growth and success.